AMSTERDAM WHITNEY GALLERY, 511 West 25th Street, Chelsea, New York City, is proud to showcase in its JULY 8 - AUGUST 9, 2011, EXHIBITION, leading Contemporary Master Artists whose work explores the abstract, figurative and natural worlds, exalting the realm of the aesthetic through brilliant coloration and dazzling form. "REFLECTIONS From a RAINBOW" is a visual odyssey of celestial paradigms showcasing golden portals that intricately interweave a universal tableaux reflecting an expressionist connection between humankind and the wonderment of our world. By emphasizing ravishing color juxtapositions which are showered with stardust and sun-kissed hues, these masterful artists communicate the ambrosial joys of our environment, and interject their compositions with exciting, positive spiritual energy. JOHN DAVIS's artistic journey reverberates in stunning compositions that forge a visual dialectic which manifests the dichotomy between subject matter and the soul, drawing inspiration from his dreams, imagination and strong belief in God, resulting in awe-inspiring abstracted and dazzling figurative canvases that celebrate the sublimity and divinity of the universe. Translating her passion for nature, ADRIENNE KYROS's panoramic watercolor vista landscape paintings eloquently articulate the joys of nature, as she relishes the magnificence of our environment and encapsulates its permanence for eternity with kaleidoscopic, sun-dappled watercolors that are a testament to the beauty of the exquisiteness of our everyday life. GENE PROKOP enshrines heavenly dreamscape visions of earthly delights in his ravishing floral, landscape and figurative paintings which pay homage to the timeless appeal of the natural world as these incandescent prismatic portals to nature are evanescent re-interpretations of the enchantment of nature, ranging from luscious floral bouquets to scenes of sensorial realms. LLOYD FRANCIS BEHRENDT's stellar "Space Launch" photography series of oil on silver gelatin prints pay homage to Cape Canaveral rocket take-offs where he offers satellite visions of our cosmos through the incandescent lens of his camera while exploring man's innate quest for the solar system and his connection to the universe. "MIRRORS of the IMAGINATION" reflects three contemporary international masters representing Serbia, Australia and Canada whose visual search for new artistic horizons explore inner visions and emotions rather than words. Transforming the banal into poignantly mystical beautiful abstract canvases, these artists explore the unconventional, always evolving into a profound metaphoric message. Their metaphysical search is visually expressed through a variety of materials and mediums creating a virtual fireworks display of creative and exuberant energy. ALEKSANDAR DEVIC invites us to his imaginary, magical surrealist world where he creates unique canvases which offer brilliant interpretations of the human condition, demonstrating his vast creativity and exciting imagination, thereby revealing images that are inspired by the subconscious. NICHOLA DOHERTY challenges the eye with abstracted expressions that reflect the deepest visceral qualities of the human heart by revealing a huetopian quest which reflects a myriad of colors, juxtaposed against a polarity of shapes that pulsate with an electric energy and are ignited by her dynamic use of brilliant and bold pigments which capture the dichotomy of human emotions. ANN HAESSEL explores the majesty and sublimity of nature, offering a unique three- dimensional quality to her ravishing abstract landscape series by introducing mixed medium fiber and texture, thereby challenging the viewer with a fresh artistic vision of our environs, by providing a broader rejuvenescent abstract-expressionist interpretation and perspective to our natural settings. Ico Gallery, New York, NY. 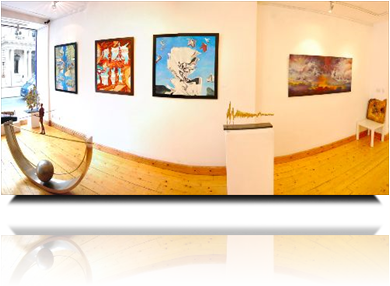 Aleksandar Devic will be exhibiting as feature artist at the Ico Gallery, 606, West 26th street, New York, NY 10001. 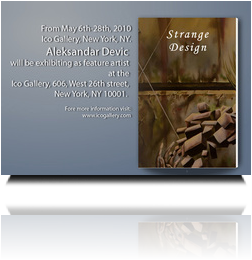 Aleksandar Devic will be exhibiting as feature artist at the Ico Gallery, 606, West 26th street, New York, NY 10001. From October 29th through to November 25th 2009. Opening Reception Oct 30th, 2009. 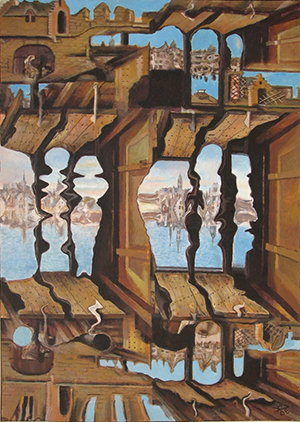 Broken Boundaries is an group exhibition project which takes place January 2012 in New York City. Featuring the most exciting and talented artists of the contemporary art world, Broken Boundaries is a show unconfined by definitions. This exhibit fea­tures excit­ing, new inves­ti­ga­tions in con­tem­po­rary image mak­ing as we move into the year of 2012. Broken Boundaries brings together a large group of international artists who utilize the gallery space as a forum to explore the dichotomy between the creative act, and the viewers response to this act. In this multidisciplinary show, each artists unique perspective is explored through a variety of sources; from landscape and the body, to abstraction and emotion. The exhibit showcases art which both creates and manifests its own personal vision, drawing on a diverse cross-section of cultures and styles to realize a wide range of visual and conceptual ideas. Inviting viewers to a world where each artists body of work speaks truths about life. Each work creates a visual pause, allowing the audience the time to contemplate their environment. Exploiting the “public space” of the gallery the curators will choreograph a exhibition that blends modes of art, design, architecture, sculpture, installation, and craft. Each of the participating artists will also appear in the visual anthology; Art In Focus: Modern Masters, as well as other concurrent projects relating to this unique exhibit; including an artists seminar, (where the artists will present a slide show of further works to the public), a documentary featuring interviews with the artists about their works, along with several other Internet projects. Born in Belgrade - 1954. 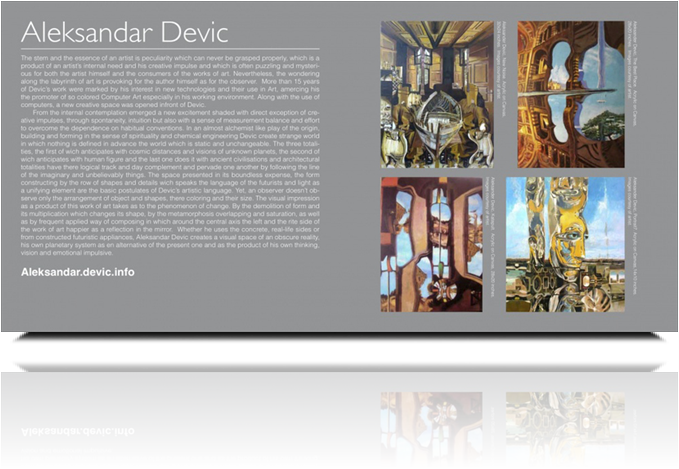 Aleksandar Devic has begun his autochthonous way along that "labyrinth" in 1978 by graduating at the Faculty of Applied Art in Belgrade and by his first independent eXhibition in Nis, and wich was marced by successful engaging in the most various branches and fields of fined Art and applied Art from painting, graphics sculpture, graphic design, computer graphics to TV video clips and web site.